Samson’s Go Mic Mobile is the world's first professional wireless microphone system for smartphones, allowing mobile filmmakers/journalists to capture incredible audio anywhere. Go Mic Mobile connects directly to iOS and Android* devices so can you start filming with high-quality audio almost immediately. 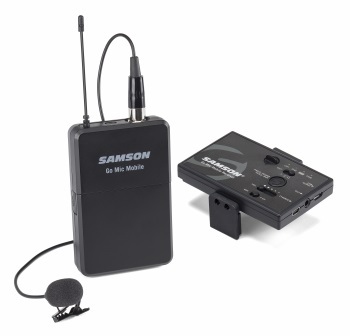 In addition to the Go Mic Mobile (GMM) Receiver, the uniquely configured Go Mic Mobile Lavalier Wireless System features Samson's PXD2 Beltpack Transmitter and LM8 Omnidirectional Lavalier Microphone for up to 100' of uncompressed digital wireless operation. The low latency transmission to your mobile device eliminates any sync issues, so you can capture, edit and share videos right from your smartphone. An additional transmitter can be added to the system for dual-channel operation. The system also includes a Lighting cable to connect to iPhone/iOS devices, USB Micro B and USB-C cables to connect to Android devices and an 1/8" (3.5mm) cable to connect to any analog audio input, as well as a varity of receiver mounting accessories (bracket arms, hook-and-loop fasteners, 1/4"–20 adapter, shoe mount adapter).